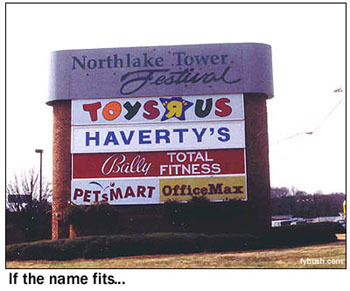 When we left you last week, halfway through our recap of our early March 2002 visit to Atlanta, we were up on the northeast side of town and rapidly heading east, in hot pursuit of the market's biggest and most exciting AM signal, WSB 750. But before we reached that site (and don't worry, we will get there), there was some interesting TV to see, just around the corner from those AM sites on Cheshire Bridge Road where we ended Part One. Less than half a mile away (clearly visible, in fact, from the AM sites) rise several candelabra towers, on either side of Briarcliff Road. 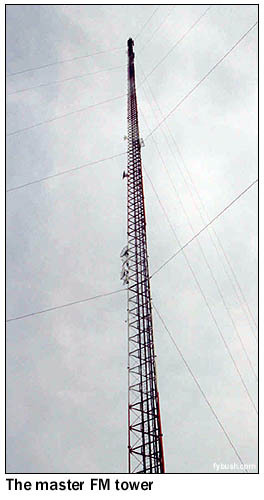 On the west side, a tall painted stick carries WGCL (Channel 46), WATL (Channel 36), and several FM stations (WPCH 94.9, WKLS 96.1 and WKHX 101.5). A new candelabra next door is being built for DTV purposes. That house you see in the foreground of the WGCL picture was the channel 46 studio until last year; we hear it's now being used as a synagogue! Just across Briarcliff Road and south a few hundred yards brings the tower-hunter to the home of Atlanta's Fox affiliate, WAGA (Channel 5). WAGA was long owned by Storer, which built many of its broadcast facilities in the form of antebellum mansions. That didn't make much sense at, say, WJBK in Detroit - but here in the home of Gone With the Wind, a studio building that looks like Tara is probably to be expected. WAGA was the market's CBS affiliate for most of its life, switching to Fox as part of that massive New World shakeup in the mid-nineties. From here, it's just two miles or so east to the spot where Lavista Road and Briarcliff Road come together, in a land of shopping centers and strip malls surrounding the interchange of I-85 and the Perimeter freeway, I-285. This was rural land just a decade or two ago, and it was "way the heck out of town" when WSB planted its mighty 50 kilowatts here. But rather than move, WSB stayed right where it was while the freeways and shopping centers moved in. And so it was that the open farmland that surrounded the WSB tower ended up covered in the asphalt of a parking lot, with a Toys "R" Us and an OfficeMax perched at the ends of the guy wires. Where's the transmitter? Carefully concealed, as it happens: look at the left side of the photomontage above, and you can see how the existing transmitter building was incorporated into that big round brick wall. WSB's auxiliary tower holds the STL dishes that point back to the studios on West Peachtree; we're told the ground system is tied into the shopping plaza buildings, which are faced with brick that complements the WSB fortress. 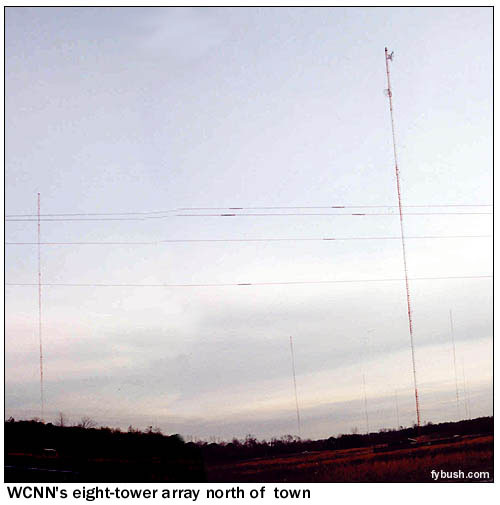 From WSB, we head south on the Perimeter, checking out some minor AM sites (the two towers of religious WGUN 1010, which cranks out 50 kilowatts itself during the day; the two towers along I-20 that are home to religious WAEC 860 and move-in Spanish outlet WWWE 1100 - you've gotta love the calls - which is licensed to suburban Hapeville, the single tower of black gospel WYZE 1480) before pulling back around to the rest of the TV and FM sites east of downtown. First stop, at the end of Arizona Avenue, is the site of WXIA (Channel 11) and WXIA-DT (Channel 10). Didn't think there was ice in Atlanta? That shield above the building is sure protecting it from something falling from the tall tower above! 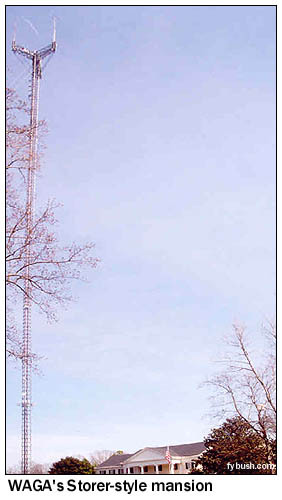 From WXIA, we can look northwest a few hundred feet to another tallish tower, which carries several Atlanta FMs and public television WPBA (Channel 30). 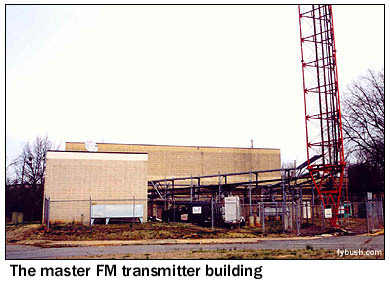 WSTR (94.1, the old WQXI-FM), WSB-FM (98.5) and WVEE (103.3) all call this master site home. We're also not far from the new tower that will be home to WUPA's digital signal when the UPN affiliate gets on the air with DTV. WUPA apparently plans to move its channel 69 analog signal over here as well, when the time comes. And less than a mile to the northwest is the oldest TV site in Atlanta - and anywhere in the South, for that matter: WSB-TV's stubby little channel 2 tower, on a rise of land that overlooks downtown Atlanta. The station has been here since day one, September 29, 1948, when it was an NBC affiliate and operating on channel 8. The channel changed in 1952, when WSB's owner, Cox, acquired the Atlanta Constitution and its unbuilt construction permit for WCON on channel 2; the network affiliation changed to ABC in 1980; the ratings stayed in first place all along. With clouds rolling in and daylight running out, our tour guide, Roddy Freeman, pointed us north on Georgia 400 to check out some of the suburban signals in the limited time remaining. 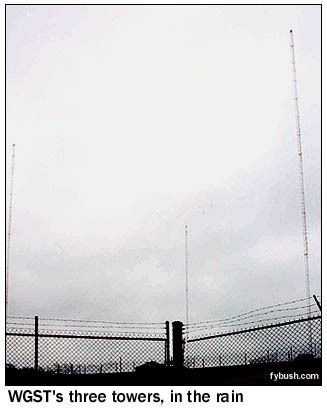 An office park just northeast of the interchange where 400 meets the Perimeter, Roddy pointed out, is crowned with the antenna bays of one of the many Atlanta-area FM move-ins that have helped alleviate the shortage of FM signals in town in recent years. This one is smooth jazz WJZZ (107.5), licensed to Roswell and owned by Radio One, which now has something like four FM signals serving portions of the Atlanta market. Heading east through land that was recently woods and is now suburban housing and strip malls, we soon arrived at a big eight-tower array, WCNN (680), licensed to North Atlanta (which doesn't actually exist in any sort of incorporated sense). The evening ends with a most satisfying catfish dinner in Roswell (thanks, Roddy!) and a return to our hotel to check out the Atlanta TV news scene, such as it is. Saturday morning dawns gray and drizzly, but we have a couple of hours to kill before we need to leave for Birmingham, our next destination, so we head back downtown to see about getting on a CNN studio tour. 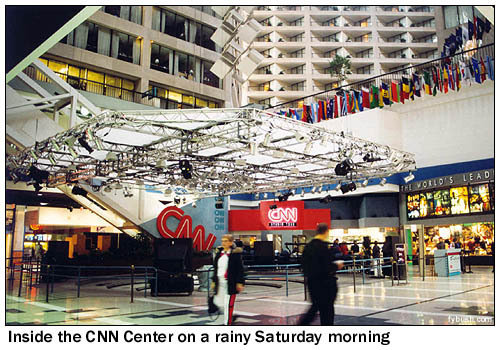 It turns out reservations are a must here (even for a former AOL-Time Warner employee, alas), so we spend a few minutes admiring the inside of CNN Center (the spot at left is where they do TalkBack Live, or whatever it's called this week; the whole place is a former Sid and Marty Krofft theme park, turned hotel, turned international news facility) before setting out to ride the MARTA rapid transit line a few stops and heading back out in the pouring rain, past the state capital, the Martin Luther King gravesite, and west on I-20 towards the Alabama state line. Just a couple of stops remain before we cross the line into Alabama: two more Atlanta AMs on the west side of town. Last week, we showed you the old WGST, the 920 facility that's now WAFS. Today's WGST is a three-tower site up on Simpson Road, a few miles west of downtown. 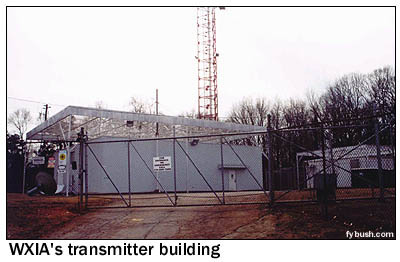 This facility was built back in the early eighties for WPBD, a short-lived urban station that inaugurated the 640 frequency in Atlanta as the old clear channels were broken down. WGST's then-owner, Jacor, bought WPBD out of bankruptcy in 1988, and soon moved WGST over to 640. By day, WGST is a fairly decent signal, pushing 50 kilowatts out of two towers in a pattern aimed mainly south; by night, though, WGST runs just a kilowatt from two towers aimed east at downtown Atlanta, completely missing most of suburbia in the process. Jacor's successor, Clear Channel, has tried to boost WGST's reach with FM simulcasts over the years (including a WGST-FM on 105.7 up in far northeast Canton, Georgia, since evolved into "Mix" WMXV but still carrying Art Bell overnight as a relic of the old days), but it's still a far cry from the big gun up the dial on 750. 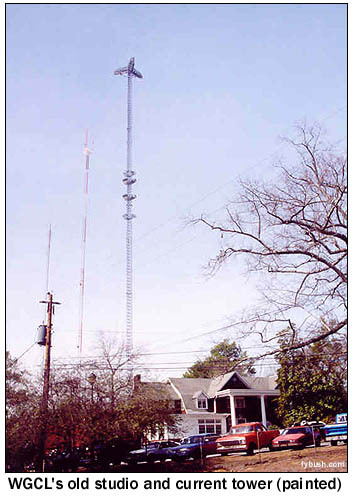 A mile or so to the west is the four-tower array of one of Atlanta's original urban voices, WAOK (1380), now doing black-oriented talk under Infinity ownership. WAOK has an expanded-band CP (for WAZJ on 1650) that's never been built, and the station seems to be in no hurry to get WAZJ on the air. And as we head west in the pouring rain on I-20, we can say with pride that in less than 48 hours we've seen most of the radio and TV Atlanta has to offer, missing only some suburban rimshotter AM and FM signals, the Stone Mountain site of public TV WGTV (Channel 8) and public radio WABE (90.1), and one old-line Atlanta signal, the 590 that was once top-40 flamethrower WPLO and is now Radio Disney WDWD, operating from a new site west of town that we just didn't make it to in the rain.